Majesty Music has enjoyed a wonderful friendship with Ray and Ann Gibbs through the years. Their vocal excellence and testimony for Christ have ministered to thousands of people around the world. 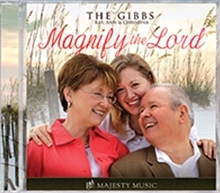 Their daughter Christina joins them in their newest CD release, Magnify the Lord, featuring some of the Gibbs' favorite songs from Ron and Shelly Hamilton. Your heart will be stirred as you listen to solos, duets, and trios of fourteen Majesty favorites.